19 1/4 by 19 5/8 in. 48.9 by 49.8 cm. 27 by 23 in. 69 by 58 cm. 51 1/4 by 37 5/8 in. 130.2 by 95.6 cm. 63 by 55 1/8 in. 160 by 140 cm. 39 1/2 by 39 3/8 in. 100.3 by 100 cm. 9 by 6 1/2 in. 22.8 by 16.5 cm. Mitchell-Innes & Nash is pleased to present an exhibition of paintings and works on paper by Croatian artist Julije Knifer (1924 – 2004). The exhibition will be the first ever solo show of Knifer’s work in the United States, and will include work from the early 1960’s through the 2000’s. In 1960, Knifer announced his intention to paint the meander motif exclusively. 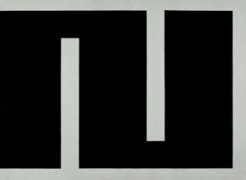 At the 1961 Music Biennale in Zagreb, Knifer was introduced to the notion of serialism in music. Knifer recognized Igor Stravinsky’s musical technique of repetition and reduction as parallel to his own interest in the “escalation of uniformity and monotony” in painting. In addition to musical influences, the severe geometric abstraction of the earliest works presented at Mitchell-Innes & Nash note the influence of Russian Suprematist and Constructivist movements, specifically Kazimir Malevich whose work was an important influence in Knifer’s early education in Zagreb. In 1975, Knifer started to create large-scale outdoor murals of the meander, including one 20 x 30 meter canvas draped in a quarry in Tübingen. The gallery will also present graphite works on paper, and paintings from the 1990’s, which demonstrate Knifer’s consistent reductionism, pushing the meander to the edge of the canvas, creating nearly monochrome black or white surfaces. This exhibition is curated by Zarko Vijatovic and is organized in conjunction with the Frank Elbaz Gallery, Paris. Julije Knifer was born in Osijek, Croatia in 1924 and died in Paris in 2004. He represented Croatia in the 2001 Venice Biennale. In 2014, the Museum of Contemporary Art, Zagreb will mount a full retrospective of his work; he has previously been exhibited at the Centre Pompidou, Paris; MAMCO, Geneva; and the Museum of Contemporary Art, Sydney; works by Knifer reside in private and museum collections around the world including the MoMA in New York City. Transmissions: Art in Eastern Europe and Latin America, 1960–1980 focuses on the parallels and connections among an international scene of artists working in—and in reference to—Latin America and Eastern Europe during the 1960s and 1970s. The radical experimentation, expansion, and dissemination of ideas that marked the cultural production of these decades (which flanked the widespread student protests of 1968) challenge established art-historical narratives in the West. Artists from Prague to Mexico City developed alternative and ever-expanding networks of distribution and organization, via Paris, Vienna, and Venice, to circumvent the borders established after World War II, local forms of state and military repression, and Western accounts of artistic mastery and individualism. One major transformation across Latin American and Eastern European art scenes was the embrace of institutional critique and an emphasis on the creation of art outside a market context. The exhibited works are on loan from the collection of Museum of Contemporary Art, Zagreb, which will exhibit a large retrospective of Julije Knifer's work in the Fall of works from the 70s up until the last century. These works are presented along side a selection of documents, which are kept in the Archive of Visual Arts Croatian Academy of Sciences and Arts in Zagreb. Izložba was established by the Ministry of Culture and the city of Osijek, which provided the Museum of Slavonia with the funds to purchase one of Knifer drawings, which is also featured in the exhibition. 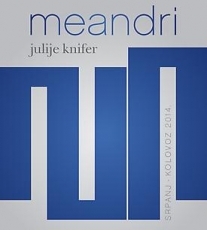 The Croatian artist Julije Knifer (1924-2004) practiced in the relam of the forever modern. The paintings, works on paper, and a video in this show, his first in the United States, revealed an artist stuck not in time--or all times. For the first time in America, we have the opportunity to see the stark abstract paintings and drawings of the Croatian artist Julije Knifer (1924–2004), which are on display at Mitchell-Innes and Nash through today. Knifer, who was one of the founding members of the influential Zagreb group Gorgona, has often been linked to conceptual painters such as Roman Opalka (1931–2011) and On Kawara (b. 1933), artists who painted time. However, in contrast to Opalka’s counting to infinity and Kawara’s dating of his canvases, Knifer developed what he called a “meander,” a maze-like geometric motif, which he introduced into his work in 1960 and employed throughout the rest of his career. The Croatian artist, who died in 2004 and co-founded the avant-garde Gorgona Group, spent forty years painting nothing but black-and-white rectilinear abstractions. Thick black lines meander across the canvases, sometimes nearly obliterating their white backgrounds with forceful fat strips. Although they’re individually elegant, in a dated, Op kind of way, the paintings work best collectively, as a lifelong exploration of difference in repetition. The mini-retrospective includes a vitrine filled with documentation of sixties-era performances, in Zagreb, which whets the appetite for a separate show on the subject. Through March 15. Will Heinrich's review of Mitchell-Innes & Nash's solo exhibition of Julije Knifer on Gallerist NY. There are more than two dozen New American Paintings alumni on view this month, and some of our favorites are among them.